As San Diego continues to become more expensive, many locals are looking for ways to cut costs any way they can. 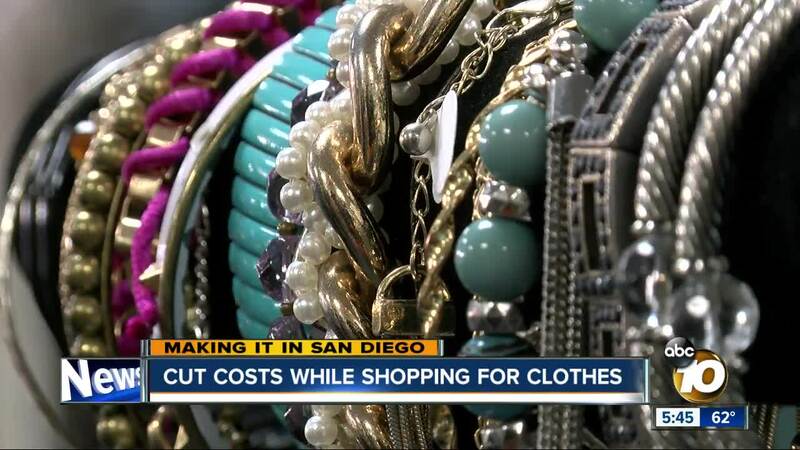 SAN DIEGO (KGTV) - As San Diego continues to become more expensive, many locals are looking for ways to cut costs any way they can. “I’m always looking for a great deal,” said San Diegan Janet Bergland. One of Bergland's favorite places to shop isn’t a luxury department store; it’s a women’s resale located in La Mesa called ACT 2. “It was always important for me to look nice and look professional, so I was able to get really nice clothes for a really good price,” Bergland told 10News. At ACT 2, shoppers can buy name brands like Michael Kors, Hudson Jeans, True Religion, Kate Spade and Lululemon at a fraction of the cost. Bergland said shopping at resale stores helped her save hundreds of dollars on her work wardrobe. The owner of Act 2, Deanne Ross, also gives people a chance to receive cash for their old items like clothing, accessories, shoes, and more. “If I know I can sell something for, say $12, if its something I need, I’ll give you half, maybe $6,” said Ross. Another store with the same concept is MIYO, located in Escondido. This store carries both men and women’s clothing, shoes, accessories, and more. “A lot of these items are brought in with the tags on them, some are in new condition, and we thrive on that. We like things that look new and still have that quality to them,” said MIYO owner Giovanna Lingenfelder. If you’re looking to sell items to the store, Lingenfelder suggests educating yourself on the types of things the store carries to guarantee a big return. “Go on our social media pages, kind of really know what we're looking for so they can get the best bang for their buck,” Lingenfelder said. Both stores say the amount of cash you receive for an item you are trying to sell depends on the brand, the condition, and the store trends and can range anywhere between 30 to 40 percent of the original price.